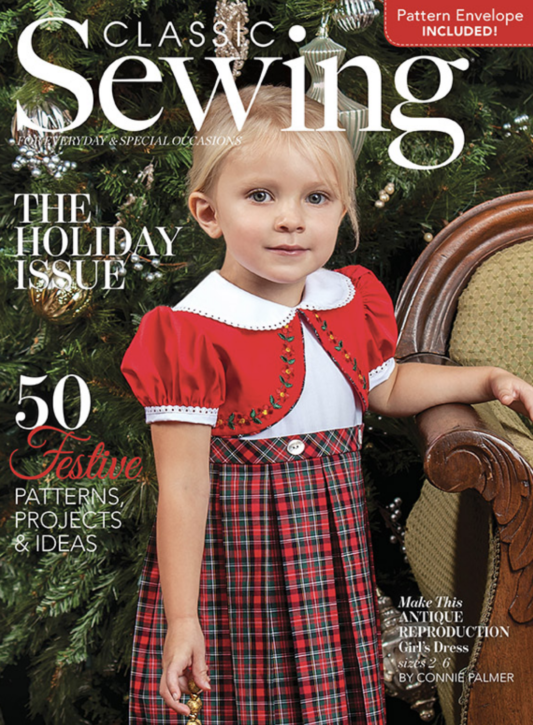 Have you received the most recent issue of Classic Sewing Magazine? Well, I just got my copy in the mail and I was excited to see my Foundation Paper Pieced Santa A-Line dressed included in the holiday issue. It’s always hard for me to work on things behind the scenes that I can’t share with you yet and I REALLY wanted to share these photos a few months ago. But I contained myself and kept them to myself (and my mom) until I could finally share. I wanted to create something for Classic Sewing magazine that was different than their usual content. I absolutely adore all the beautiful smocking, tailoring and attention to detail so many of the designers include in the magazine. However, I wanted to draw a little bit from the quilting side of things and incorporate foundation paper piecing into a garment. 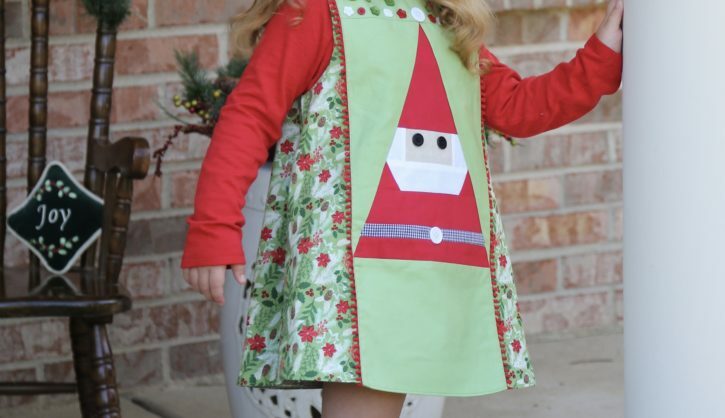 So that’s how I came up with this foundation paper-pieced Santa. In a nutshell, foundation paper piecing is a very accurate method of patchwork, which is especially useful for piecing unusual or awkward shapes and achieving crisp, clean lines. You sew your fabric to a paper pattern (the foundation) which makes it wonderful for using up scraps of fabric and takes the headache out of having to cut very precise pieces. 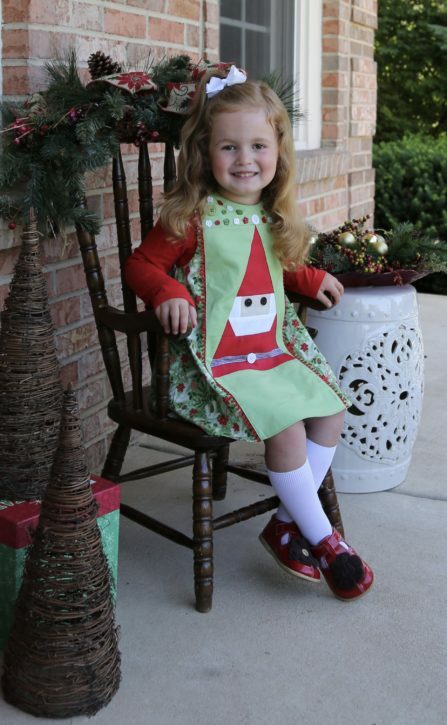 The pattern for the Santa and all the instructions can be found in the newest issue of Classic Sewing magazine. I take you through all the steps and techniques that you’ll need to get started with foundation paper piecing. If you are not a magazine subscriber, you can pick up a copy at your local bookstore such as Barnes and Noble. The magazine is on the pricer side, but it includes SO many patterns. It even includes a pattern envelope with some of the patterns included on full size pattern sheets. It’s an amazing value and you can learn so much from reading all the articles. 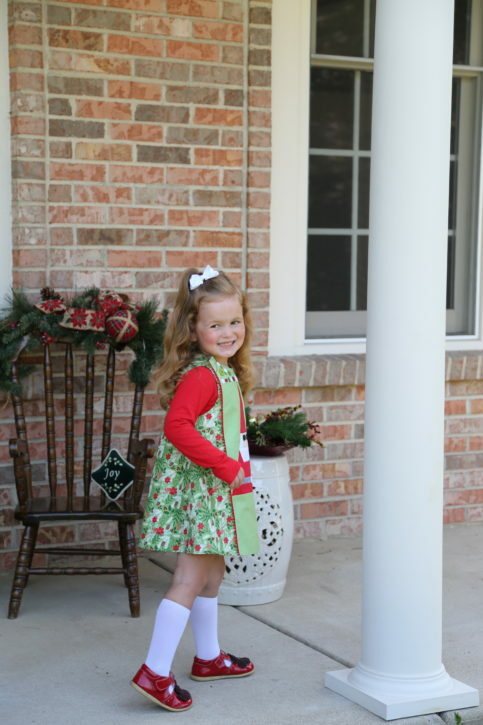 So, I was kind of giggling when I set up this photoshoot on our front porch in the middle of the summer! Nothing like pulling out the Christmas decor and taking photos in the front of your house, to make your neighbors think that you might have lost your mind. 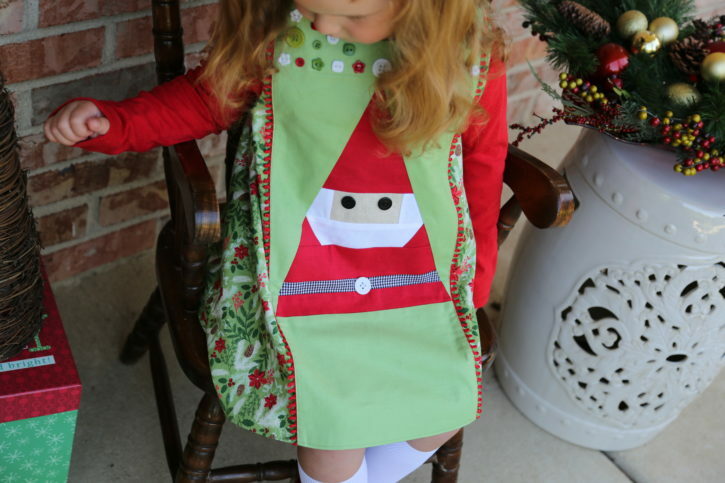 I incorporated the Santa into my Ruby Ruffle Dress A-Line pattern, but you could also use my Janey Jumper pattern or another A-Line dress pattern. I added all kinds of fun buttons to the top of the dress for some added interest and texture. 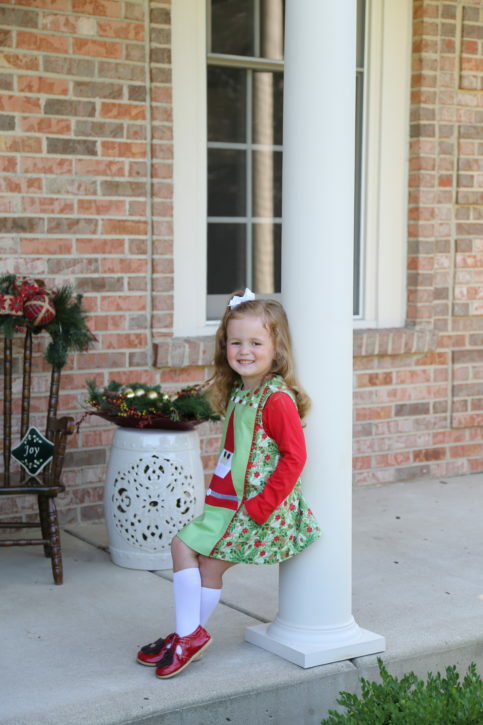 The fabric is from Riley Blake Designs and was the holiday fabric that was included in last year’s Christmas fabric bundle box that I sold in The Cottage Mama shop. I used loopy trim on the sides that I purchased from Farmhouse Fabrics. 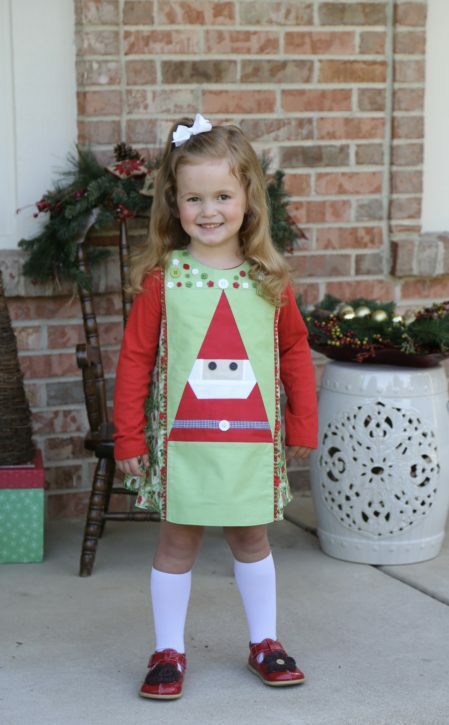 I think this is definitely a dress that JoJo will have fun wearing this holiday season! 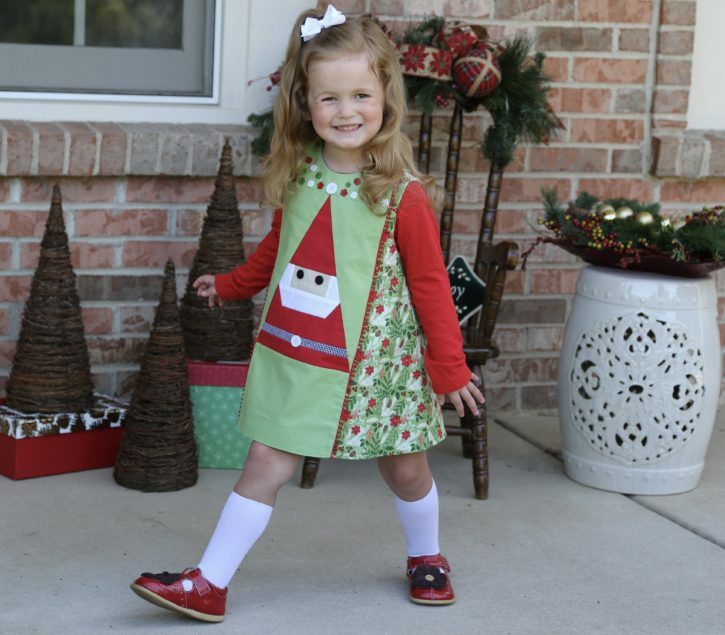 Make sure to share your foundation paper pieced dresses over in The Cottage Mama Patterns Group on Facebook or tag @thecottagemama on Instagram so I can checkout what you are creating for the holidays. 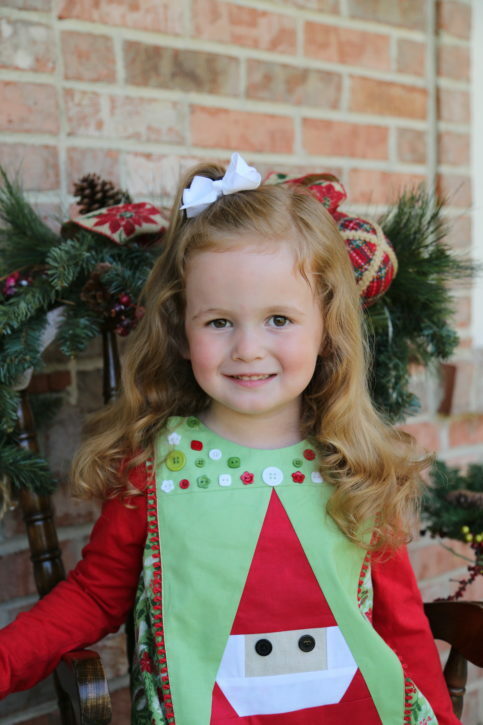 Happy 4th Birthday, Josephine Mae!